PowerPoint is probably one of the most used softwares in a corporate environment. So third-party companies cache-in and create apps and products to support or maybe earn some extra benefits due to popular software. In this post, we will provide you four of those PowerPoint apps that helps in making it more productive and beneficial from third-party developers. It’s an application that helps a regular sales guy to make a presentation while focusing on meeting requirements of regulatory compliance and maintaining brand consistency. Company’s compliance is one of the biggest issue, and in a survey, done on 300 customers determined that only 38% sales content is according to policies and that maintained the requirements. This app helps in with changeable Q&A that is designed to match the business logic and aims of this industry, this in turn keeps the slides and presentation to provide relevant information. Its price starts from $20 per month per user. 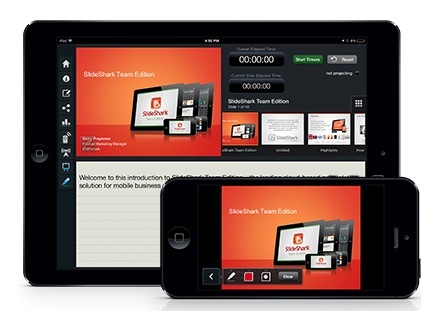 If you want to use your mobile device while using a PowerPoint presentation, then SlideShark can be very handy. This app allows your iPhone and iPads and other iOS devices to show presentation directly from them with graphics, videos and animations. It also has a free version for individuals and paid one that can offer more enhanced features for businesses, like data analyzation dashboards. This app enables us you to use your Android device for editing PowerPoint, Excel and Word files; making it a complete package for Microsoft Office users. It’s a free app that is very popular in Android App Market, and its current rating is 4.5. It also has different standalone version for Android Devices like for Samsung Galaxy Note. Compare for PowerPoint is for collaboration with your work group or coworkers. It enables you to see twin versions of the presentation where you have original and modified version that can be compared to see the results. With good interface showing color-coded thumbnails and slides that are modified, can provide you with less confusion on mobile devices. It has a 14-day trial of the software.